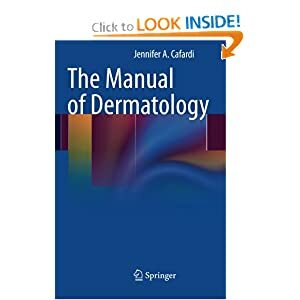 The Manual of Dermatology was developed by Dr. Cafardi at the University of Alabama at Birmingham, Department of Dermatology, and covers broad dermatological topics necessary for any dermatology resident treating patients. Topics include alopecia, medication dosing and management pearls, fungal disorders, genodermatoses, differential diagnoses of various skin diseases, management of infections, surgical anatomy and tips, HIV dermatology, pediatric dermatology, and skin cancer management and terminology. The practicality of this book is unique and includes key clinical data for residents, making it essential as a reference for quick differential diagnoses, work-up tips, management, and treatment options. This quick reference offers a more practical approach to dermatology, with drug names and dosing, and more information on mycology/onychomycosis than any other handbook on the market. The Manual of Dermatology is portable, comprehensive, easily accessible, and is based upon algorithms, tables, and pearls taught to dermatology medical students, making it a vital resource in all university medical libraries across the country. The Manual of Dermatology was developed by Dr. Cafardi at the University of Alabama at Birmingham, Department of Dermatology, and covers broad dermatological topics necessary for any dermatology resident treating patients. Topics include alopecia, medication dosing and management pearls, fungal disorders, genodermatoses, differential diagnoses of various skin diseases, management of infections, surgical anatomy and tips, HIV dermatology, pediatric dermatology, and skin cancer management and terminology. The practicality of this book is unique and includes key clinical data for residents, making it essential as a reference for quick differential diagnoses, work-up tips, management, and treatment options. This quick reference offers a more practical approach to dermatology, with drug names and dosing, and more information on mycology/onychomycosis than any other handbook on the market. The Manual of Dermatology is portable, comprehensive, easily accessible, and is based upon algorithms, tables, and pearls taught to dermatology medical students, making it a vital resource in all university medical libraries across the country.